Bang Nhat Linh was born in 1983 in Hanoi. Linh is amongst the most talented and active artists of his generation. 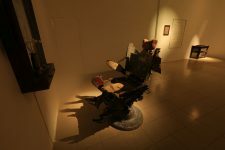 In 2014, he was featured, in a book that examines the Vietnamese art scene and 9 outstanding local artists born in 1980s: “Art and Talents” as “having an unique artistic identity, different from other colleagues of his generation…”. He is known as a collector of war memorabilia. The primary concerns and inspiration for his artistic practice is human beings.